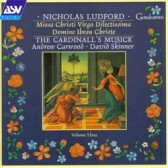 The Missa Christi virgo dilectissima presents Ludford’s most meditative and serene setting (not unlike the Missa O bone Jesu by Fayrfax recorded on CDGAU184). It is scored for the more usual combination of five voices, and has been set in the context of the Mass of the Annunciation. Completing the disc is the Jesus antiphon Domine Jesu Christe, an excellent example of Ludford’s style – a style which clearly points the way to new methods in English composition.